The BRDM-2 (Boyevaya Razvedyvatelnaya Dozornaya Mashina) is one of the unmistakable vehicles of the Soviet Block. It was built to an extent of 7,433 vehicles by the Molotov GAZ plant in Nizhny Novgorod, Ukraine, when its production stopped in 1989. Other numbers ranged between this and 7200 (MilFactory and Wikipedia), less than the former BRDM-1 (about 10,000). But despite this, it was sold to about 50 countries and declined into much more variants, perhaps because of its roomier interior it proved more versatile overall. The paradox was it was, like the previous vehicle not a “strict” 4×4 but in reality a convertible 8×8, with a central pair of roadwheels that can be lowered to add extra grip on soft grounds. BRDM-2 in the 1966 military parade, where it was first revealed publicly. Numerous shortcomings of the BRDM-1 quickly became obvious: Lack of NBC protection system, no night vision equipment, exposed gunner, no special sights. Plus its front engine configuration limited the payload. These drawbacks spurred the same technical teams from the OKB design bureau, under the direction of designer V. K. Rubtsov to create an improved reconnaissance vehicle in 1959. The BRDM-2 entered service with the Soviet Army in 1962, after a short testing phase (BTR-40P) but only publicly shown in 1966. At that stage and from then on, it replaced the BRDM-1 in the Soviet and Warsaw Pact armies. The BRDM-2 is also closely related to the Hungarian FUG (OT-65) and FUG-70 amphibious scout cars. 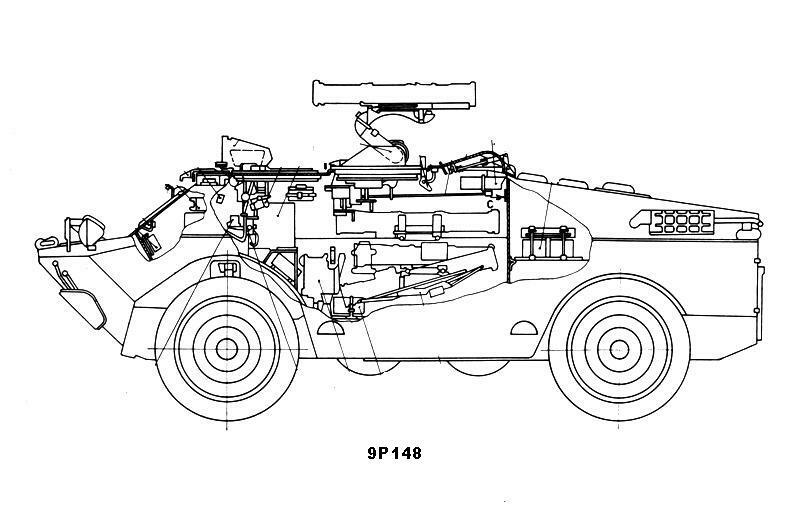 Other names for the BRDM-2 were BTR-40PB, BTR-40P-2 and GAZ 41-08 (factory designation). Differences with the BRDM-1 are quite obvious for the appearance alone, with a bigger engine moved to the rear, and therefore a roomier crew compartment with the driver’s cab nearer to the front. Similarities comprised the chain-driven belly wheels and the centralized tire pressure regulation system. But it had better amphibious characteristics and a more powerful engine. It was also armed with a turret in standard (none of the previous BRDM) and its main compartment proved quite adaptable. The GAZ-41 gasoline V-8 indeed was rated fro 140 hp whereas the former GAZ-40PB V8 gasoline engine only gave 90 hp (70 kW). Power-to-weight rose from 16hp/t to 18.2 hp/tonne and top speed from 90/9 kph to 100/10 kph on land and water. Its Wheeled 4×4 (+ 4 auxiliary wheels) configuration was kept, and the main train was suspended on leaf springs with hydraulic shock absorbers. Ground clearance was 430 mm (17 in), Fuel capacity 290 liters (64 imp gal; 77 US gal) for an operational range of 750 km (470 mi), same as the older BRDM-1. For amphibious operations, the front trim vane was raised, a bilge pump was activated in backup, while propulsion relied on a circular water-jet with a four-bladed propeller at the rear of the vehicle powered by the V8 and protected by an armored shutter when on land. The BRDM-2 could sustain a 10 kph swimming speed for 17 to 19 hours. The boat-shaped hull was made of welded steel, with a thickness of 10 mm on front, 7 mm sides, rear and top of the turret, 14 mm for the hull nose plate, 5 mm upper front, 7 mm lower front, sides, rear and top, and 2 mm on the hull front floor and 3 mm for the rear floor. The crew of 4 comprised the driver (left) and commander (right) in the front cab, and gunner and co-gunner behind. The front comprised two large armored shutters, a serie of periscopic sights above covering the front and sides, and two escape roof hatches. With a maximum of 14 mm it could not be penetrated by artillery fragments and .50 caliber machine gun fire, however, its tires were not protected but there was a central inflation system that can compensate for punctures. The great novelty compared to the previous BRDM was the central one-man BPU-1 conical turret (without top hatch) borrowed from the BTR-60PB APC, housing a 14.5 mm KPVT heavy machine gun with a coaxial 7.62 mm PKT. The former could fire 150 rounds a minute (cyclic rate 600 rpm) with an effective range (day) of 2,000 m. With its great elevation (-5, +30°) it could engage aerial targets such as helicopters or low-flying aircrafts. API-T, I-T, HE-T, and MDZ ammunitions were used, and the first could penetrate 20 mm of armor at 1,000 m or 32 mm of at 500 m. The tactical range for air targets was 1,400 m.
This was the base armament but depending on the variants, other systems were used (see below) such as the famous AT-2 “Sagger” AT-3 “Swatter” or AT-5 AT-5 “Spandrel” quad ATGW launcher. The commander was given six TNP-A periscopes (5 front, 1 side), TPKU-2B day sight and a TKN-1 night sight. The driver had four TNP-A periscopes, one could be swapped for a TWN-2B night sight. Two firing ports were also provided on the sides. In addition to the IR spotlight and four IR driving lights, the BRDM-2 was given an overpressure collective NBC filter system. There was also an R-123 radio and an antenna on the right side of the hull and an internal winch front) with 30 m cable and 4-tonne capacity. Just like for the BTR-70, a spare tire can be mounted on top of the turret. During production, vehicles were eventually given two additional turret periscopes, one on top, one left-hand side of the turret and a TNA-2 navigation system. BRDM-2RKh (khimicheskaya razvedivatel’naya mashina), the radiological-chemical reconnaissance vehicle. Equipped with KZO-2 rectangular flags dispensers to mark contaminated areas, GSA-12 automatic gas detector, DP-5V dosimeter, DP-3B röntgenmeter, DK-4K decontamination apparatus and PPKhR and VPKhR detection devices. Used by regimental chemical defense platoons. The improved BRDM-2RKhb is also used for biological threats and uses the DP-5B röntgenmeter, KZO-2 dispenser, and biological aerosol detector ASP. The 14.5 mm KPVT is replaced by a lighter 7.62 mm PKT (in addition to the coaxial). BRDM-2UM (mashina upravleniya) command vehicle. Turretless, carrying the 1 kW generator, extra radios (two R-123, R-107, or R-105M, R-108M, R-130M), and big antenna base on the side. This rare vehicle is primarily built for export. 9P122 “Malyutka” tank destroyer. Features an x6 telescopic launcher with overhead cover replacing the turret. The same configuration is used for other vehicles of the same TD type. Fires the 6x9M14M “Malyutka-M” AT-3B Sagger B, with 14 carried in total inside. Used by regimental and divisional anti-tank units combined arms armies. Crew of two (driver and operator). The improved 9P133 “Malyutka” is given a 9S446 sight, additional windscreens and 9M14P “Malyutka-P” (AT-3C Sagger C) and 9M14P1 missiles, with up to 18 in store, which used the SACLOS guidance system. 9P148 “Konkurs” Tank destroyer, using an x5 wire-guided 9M113 “Konkurs” (AT-5 Spandrel) launcher (10 in store) and alternative 9M111 “Fagot” (AT-4 Spigot) (14 in store). Front right sight for the gunner, improved 1PN66 day/night thermal sight and whip antenna mount. Also called BRDM-3 in the west. 9P31 SAM carrier. Fire the 9M31 surface-to-air missile (SAM), belonging to the 9K31 Strela-1 system (NATO: SA-9 “Gaskin”) which is a low-altitude system. The x4 ramp is located externally over the former turret, lowered when traveling. No belly wheels. 8 missiles in store. A crew of three. Known variants have resupply racks on the upper sides of the hull, and/or the passive radar detection system 9S12 (FLAT BOX A) plus three sensors. ZS-82 (zvukoveshchatel’naya stantsiya) – PsyOps vehicle. Large box speaker array, top of an unarmed turret. TM-1 (civilian) fire and rescue vehicle. Visual warning device, top of the unarmed turret. ATM-1 “Ingul” (civilian) Emergency turretless transport vehicle. SPW-40P2 (Schützenpanzerwagen) also locally called SPW BRDM-2. SPW-40P2(K) Local command vehicle with a telescopic mast. SPW-40P2 M/F signals vehicle R-123MT radio, TNA-3 navigation system. SPW-40P2UM (local BRDM-2UM), and test vehicle of 1987 with 2×4 or 2×5 mechanical launcher systems FLG 5000 illuminating rockets. Romania: Used Tank Destroyers versions, 138 (12 9P122 “Malyutka”, 78 9P133 “Malyutka” and 48 9P148 Konkurs) total. Yugoslavia: Unknown numbers, passed onto the successor’s states. About 2080 BRDM-2 registered in service as of 2013. BRDM-2M: Modernized version by Arzamas (also for export), which includes the GAZ-562 of 175 hp or Steyr D.245-9 of 136 hp diesel, 6 MB smoke grenade dischargers plus BTR-80 style turret, new wheels, and GPS navigation system. The BRDM-2A is in service with Russian Armed Forces. In alternative, some use the MA3 or MA4 (MT-LBM carrier). They are showing an engine exhaust on the right side and sometimes a raised engine deck. BRDM-2PPM: Fire and rescue vehicle. Armoured shutters and windshields replaced by windows, plus two additional on the front corners of the hull. Turret replaced by a crate apparatus. Two side hatches and small hatch in the rear. Umka (civilian): Front replaced by a tall superstructure with two windshields front, window on each corner, two small windows on side doors, two rear view mirrors and an additional IR spotlight. ZKDM Small windows removed, new frontal armor, single door on each side, no belly wheels or single water-jet, new diesel D-245.30E2 (150 hp). V-hull for crew survivability against landmines and IEDs, B-32 hull protection level against AP incendiary rounds. Total weight 7,300 kg, crew of three, new remotely controlled turret (+15º, a depression of -30º) with double-barrel 23 mm GSh-23 cannon, modern FCS. 7.62 mm coaxial PKT LMG plus 30 mm AGS-17 grenade launcher and 4x 57 or 80 mm rocket launchers, two smoke grenade launchers each side. Equipment also includes BPK-2-42 day/night sight, TV system max range 1,000 m, GPS GLONASS navigation system. BRDM-2 Politsei Estonian Police vehicle, no armament, covered lighting array on top of the turret, no firing ports IR spotlight on top of the turret, and two periscopes on the left side. Two rear view mirrors. 7 vehicles, no longer in service. Latvia 2 vehicles, no longer in service. Lithuania 10 ex-Polish vehicles in service as of 2006. Alesiya civilian amphibious armored truck, BRDM-2MB1 (new diesel D245.30E2 155 hp, procuring a 900 km range) by the 140th Repair Plant in Borisov. Former Czechoslovakia used a number of vehicles that were all modernized after the fall of the Berlin wall. –LOT-B/BRDM-2/99 (lehký kolový obrněný transportér) upgrade with Renault DCI 4C turbocharged diesel (162 hp), no belly wheels, side hatches, slat-type armour (vision ports), new NBC system, GPS, boxed-in exhausts, six MB smoke grenade dischargers, new turret with NSVT 12.7 mm heavy machine gun, and new day/night vision sights. The LOT-VR command variant is given additional signals equipment and generator. –BRDM-2ch: Modernized chemical recce variant. GSP-11/GSP-12 Automatic Chemical Agent Detector Alarm, CHP-79 Chemical Agent Detector, IT-65/DP-86 Radiation Meter, R-123 Radio, KPO-1 Area Marking System, MK-3 Area Marking System, single PKT LMG. –OKV-P (obrněné kolové vozidlo pro policii) police variant, turretless (spare wheel and new hatch instead) with side hatches, armoured windows, police lighting array, large front bumper, inset head, side and big turn lights, small turn lights, new sights with slotted armour, rear view mirrors, roof lights, boxed-in exhaust. Developed by the Local State Military Scientific & Technical Center: Remotely operated 23 mm 2A14 type automatic cannon and coaxial 7.62mm PКТ, additional side doors, 4×4 smoke mortars, day vision TV camera, added windows, special front folding wire-cutting device, new engine. This country did use a number of vehicles in the Soviet era. Modernized vehicles used by ISAF in Afghanistan had two rear view mirrors. VS BRDM-2 (vegyi sugárfelderítö úszó gépkocsi) NBC reconnaissance vehicle. Very similar to the BRDM-2RKhb, with square metal flag dispenser right rear and MK-67P, DS-10, Gid-3, IH-95 and TMF-2 detection systems. The country was the second largest operator of this vehicle outside USSR in the Soviet era. In service were 200 BRDM-2s, 120 BRDM-2s (now upgraded to BRDM-2M-96/i and “Żbik”), 22 BRDM-2s (mod BRDM-2M-96ik “Szakal”), 100 9P133 “Malyutka” and 18 9P148 “Konkurs” tank destroyers, plus a dozen of BRDM-2RS NBC recce vehicles, 9K31 Strela-1 SAM carriers, and BRDM-2 R-1A/R-5 command vehicles. More recently SFOR vehicles were spotted with an IR spotlight in the front of the turret. BRDM-2M-96 (1996) Local conversion without belly wheels, side doors, alternative driver’s PNK-72 night vision device, commander POD-72 day/night sight, new seats, a new engine and fighting compartment heaters, GPS, new communication equipment, spare wheel (mounted rear of the hull). Used by Polish Kosovo Force units. One version had an IR spotlight (SFOR), additional small IR spotlight (KFOR). BRDM-2M-96i (1997) It was given an Iveco Aifo 8040 6-cylinder diesel plus new stowage arrangements, two-circuit brake system, 24V electrical system, two rear view mirrors, additional headlights protection. SFOR variant uses an IR spotlight. BRDM-2M-96i ASRAD (2002) Two demonstrators with Rheinmetall ASRAD-R missile air defense system. BRDM-2M-96ik “Szakal” (2003) Developed by WZMech with an Iveco Aifo 8040SRC 6-cylinder diesel engine, air conditioning unit, new accumulators, Fonet internal communication system, RRC-9500 radio, R-3501 portable radio, .50cal WKM-B HMG in turret and gunner CDN-1 day/night sight. Used by KFOR and IFOR units. With combat experience, WZMech provided improvised armour skirts, and on the “Szakal Plus”, all around RPG fence, anti-cumulation screens and additional armour plus internal anti-splinter mats. BRDM-2M-97 “Żbik-B” also called BRDM-2B, includes the Iveco Aifo 8040 SRC-21.11 6-cylinder diesel engine (for 8 tonnes), 145-litre fuel tank (range 500 km), new transmission, Deugra automatic fire extinguisher, ZPD 24/2 power source, Thermo 90DW heater, axial compressor, UNZ-50 GPS inert navigation system, AAS-1 Taifos radiation detection system, SSC-1A Obra laser warning system and new NBC and filtration system, TNPT-1 commander sight. New turret with better elevation, NSVT HMG, top hatch, gunner’s CDN-1 day/night sight, 6x 81 mm Cytryn smoke grenade launchers and rear stowage basket. The BRDM-2BF have a pintle mount for 9P135M launcher (4x 9M111 “Fagot” (AT-4 Spigot) or 9M113 “Konkurs” (AT-5 Spandrel) ATGMs). Troop equipment also comprises 60 mm LM-60K mortar, RPG-7, 7.62 mm PKM, 26 mm wz.78 flare gun, 18 hand grenades and LNS laser range-finder. The maximum speed decreased from 100 km/h to 90 km/h on the road and from 10 km/h to 4.2 km/h in water. The sub-variant “Żbik-P” had a footplate over side episcopes, and the experimental “Żbik-A” (2001) a more sophisticated BAA electro-optical system (STN Atlas-Elektronik) plus AN/PPS-5C (SEI MSTAR) ground surveillance radar, and additional radios. BRDM-2 R-1A (1986) Local command/signal variant with 2x R-123Z, R-107 radios and telescopic mast. BRDM-2 R-5 Improved command vehicle (BRDM-2D) with R-130 and R-123M radios, R-323 and R-870M receivers, sword and AZI antennaes, plus mount for frame antenna. Bosnia Herzegovina: BRDM-2 based tank destroyers converted into APCs. Croatia: 9 vehicles (now retired). Afghanistan – Captured vehicles from the war with the Soviet Union brought back to working condition. Algeria (60 BRDM-2 and 64 9P122 “Malyutka”), Angola (50), Armenia (120), Cambodia (200), Cameroon (200–300), Cape Verde, Ivory Coast (13 ex-Belarus 2003), Cuba (100 BRDM-2 ex-Czech, 50 mod 120 mm mortar), Djibouti, Egypt (300 BRDM-2, BRDM-2UM and later 100 BRDM-2M96i by Poland), Eritrea, Estonia (7), Georgia (17), Guinea (4 ex-Ukraine 1998), India, Indonesia, Iraq (BRDM-2 +ZPU-2 twin 14.5 mm KPV, 13 ex-Ukraine 2006, and before 1991 1,300 BRDMs), Libya (350 mod Czech 2013), Kurdistan (Peshmerga), Macedonia (10), Madagascar (2), Moldova (27), Maldives, Mali (20 + 64 ex-URSS and Bulgaria), Mongolia (120 BRDM-2 & BRDM-2Rkh), Namibia (12), North Korea (? ), Palestine (45 1995, some seized by Hamas Gaza June 2007), Pakistan (Captured ex-Afghan), Peru (late BDRM-2 and 9P133 ATGM TD), Sahrawi Arab Democratic Republic (late BDRM-2, 9P31 SAM), Singapore, Slovakia, Slovenia (5 late prod), Sudan (60 ex-Belarus 2003, 21 as of 2004), Syria (950), Somalia, Turkmenistan (30), Vietnam (200), Zambia, Zimbabwe. Former users also include the Al-Murabitun (Lebanon), Grenada (2 delivered 1982), and Palestine. It would be too long to enumerate these conflicts due to the widespread use of the vehicle, which encompasses most of the cold war and probably will include more, as it is still in service. -For most of the Afghanistan war, BRDMs wee used extensively by Soviet forces. Many were later abandoned and reused by Afghan forces. -BRDM-2s were deployed by Arab nations such as Egypt and Syria in the 1973 Yom Kippur conflict and war of attrition. Many were captured by Israeli forces, including BRDM-2UM and 9P122 “Malyutka” TDs. -Iraqi BRDM-2s saw action in both gulf wars. South African Forces also met this vehicle used by Angolan FAPLA, and one at least was destroyed by a Panhard AML-90 during Operation Savannah (1975). -In ex-Yugoslavia JNA BRDM-2s were used in the Ten-Day War as well and Croatian War of Independence, or by the Yugoslav Army (VJ) against the KLA in Kosovo and by opposing UN vehicles brought by Polish, Ukrainian and Russian units of the Kosovo Force. -Recently, the Eastern Ukraine insurgency saw BRDM-2 variants used by both sides. On 13 June 2014, in the battle to retake Mariupol, the Azov and Dnipro-1 Battalions and the National Guard destroyed an insurgent BRDM-2. Shared also by the BRDM-1 these were poor ergonomic design, low level of crew protection and high fuel consumption. For that matter, the Polish modernized versions and Ukrainian BRDM-2SMD get rid of the belly wheels, freeing space for two men. The unique flaw of the BRDM-2, however, was the possibilities for the crew to escape their vehicle while in combat: They had to use the two front hatches, exposed to enemy fire. The problem was also if the vehicle topped over and these were blocked. Again, the Polish Czech and Ukrainian revised versions were given side and turret hatches. Armament 14.5 mm KPVT, 7.62 mm PKT coax – see notes. Egyptian BRDM-2, 1967 six-days war. Polish Szlazak as of today. First paragraph says something that I don’t understand… “Cccccccccccccc”. I assume it is a glitch. Indeed Juan, it was a short-lived automatic replacement mess. Nizhniy Novgorod is in Russia, not in Ukraine. Where would be the best place to buy one of these? Very interesting stuff, couple corrections, the BRDM-2 electric bilge pump is only a back up. The primary bilge is achieved by suction from the when submerged propeller. Also the tyres are protected as there is a constant tyre inflation system which will compensate for multiple punctures from small arms fire. The inflation system also allows the driver to change the tyre pressures on the move. One flaw I would like to add though is the loss of power steering when you depress the clutch. Its very annoying for turning in limited spaces. Nevermind, I found your article on the Commando. Will you do the M1117 though? We will definitely do an article on it, provided of course that one of our writers has sufficient information and time.